Three years ago, when The Invisible Event was but a callow youth, I happened upon a Sherlock Holmes-universe novel co-written by someone who shared their name with NBA Hall-of-Famer Kareem Abdul-Jabbar. “Wow,” I thought, “that guy must hear the same thing all the time…” — and then it turned out that it actually was NBA Hall-of-Famer Kareem Abdul-Jabbar, and, well, I became even more interested. Things are going a bit Holmesian here at The Invisible Event for the next week or so: a post every other day on something Sherlock-oriented. Why? For the simple reason that I feel like doing it. I should probably wait for the BBC special at Christmas to theme it up a bit more, but Christmas is a busy time and so I’m doing it now instead. I wouldn’t call myself die-hard Sherlockian enough to immediately sign of up for anything produced in that universe – material enough to consume more than one lifetime – but the character and context retain so much potential that I will dip in where I believe someone might do something worth checking out. The reference-filling short stories written by Adrian Conan Doyle both with and without the help of John Dickson Carr, the entertaining Professor Moriarty books by Michael Kurland, the tales by short story specialist Ed Hoch, Laurie R. King’s Mary Russell books, Caleb Carr’s The Italian Secretary, and Anthony Horowitz’s Holmes pastiche The House of Silk and universe-widening Moriarty (among others like Colin Dexter’s sole Holmes story ‘A Case of Mis-Identity’) all testify to the presence of life in the old dog yet, and Arthur Porges wrote a couple of pastiches I’d like to track down, so there’s still more to try. 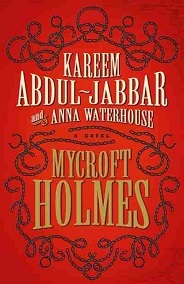 Today, however, belongs to NBA Hall-of-Famer Kareem Abdul-Jabbar and scriptwriter Anna Waterhouse (the two had previously worked together on basketball documentary On the Shoulders of Giants) who have taken the universe in a new direction for me in exploring the life of elder Holmes brother Mycroft. This doesn’t fulfil my remit of impossible crimes or 1920-59 crime novels, but a decent Sherlockian pastiche is always worth flagging up and – since this is much more than merely decent, it’s an astonishingly assured and authentic undertaking that fits beautifully alongside the canon – I would like to bring this to your attention, hence a secret review on an uncommon day for me. Obviously the sensible thing to do when expanding on the Sherlockiana already available is to work within its accepted limits – fog-shrouded London, or a small provincial town if that’s been booked already. The first quarter does exactly this: establishing Mycroft’s (more) youthful days and career, his friends and social context, and slowly builds a picture of a man enjoying his intelligence, physicality, native cunning and station in life. A quick trip to visit Sherlock at university also sets up a very interesting dynamic between the brothers, with Mycroft absolutely the instigator in bringing out Holmes-the-Younger’s talents in observation, that possibly takes a few too many liberties but also honestly feels like something that works in the context of the canon. Sure, Mycroft is possibly a bit too in love with his perfect and blamelessly wonderful fiancée, but there might not be so much of a story without that and so we’ll let it pass. He watched her bow rise and dip over angry black water that seemed not so much beneath as all around her, while above her the twilight sky was a patchwork of mist and fog and flying scuds of rain, so that there was no respite to be had, either above or below. Yes, the deliberate, considered pacing may not be to everyone’s taste, and it could use a few more narrative surprises, but what they’ve produced here is more than a mere aping of Conan Doyle – this expands the universe appreciably, gives you characters that breathe and a setting that supports the wider arc of Mycroft’s journey (in whatever form you choose to interpret that). There’s no clumsy retro-fitting, barely a false step in the execution, and you could pick up the Holmes canon and encounter the Mycroft therein without feeling too great a dissociation from the naive young man you have to work with here (though that, of course, is part of the point – he’s a virtual unknown in Conan Doyle’s stories). As you may have gathered, I quite enjoyed this. It’s a massively respectful and professional piece of work, and in terms of its joy in the use of language among the best-written books I’ve read this year. Most excitingly, the Mycroft on the final page is not the Mycroft that Conan Doyle gave us, so there is obviously more work to be done. It is sincerely to be hoped that Adbul-Jabbar and Waterhouse are at work on a follow-up, as this young man has found himself in the most capable and respectful of hands. Wonderful stuff, could not be more highly recommended. Come back on Monday for some Genuine Original Sherlock – Arthur Conan Doyle-written and everything. Hand on heart.